Always the latest software. Flexible and simple. The market is constantly changing and requires increasingly innovative and complex solutions. To stay ahead of the game, you need software that grows along with you. With the Maintenance Subscription and Desktop Subscription, you'll have the latest version of your CAD software, including the newest features, productivity tools, and time-saving workflows. In addition to up-to-date software, the Cloud Service Subscription gives you access to the powerful Autodesk Cloud applications. Outsource time-consuming tasks like rendering, simulation, and optimization to the cloud while you focus on your design. Wouldn't it be great if you could seamlessly exchange knowledge with your colleagues, suppliers, and clients by using the same CAD software? This is possible with an Autodesk Subscription! Receive the latest software updates as soon as they are released. Access new and old versions of your software at home, in the office, or on the go. Communicate clearly with your team and gain easy access to files, wherever and whenever you want. Outsource rendering, visualization, and analysis simulation to the cloud. Whether your projects are temporary or on-going, you want your software to be manageable and predictable. Businesses grow, projects expand, and employees come and go. Tailor your licences to your specific needs. You want round-the-clock access to the latest Autodesk tools, flexible licences, powerful support, and cloud services. 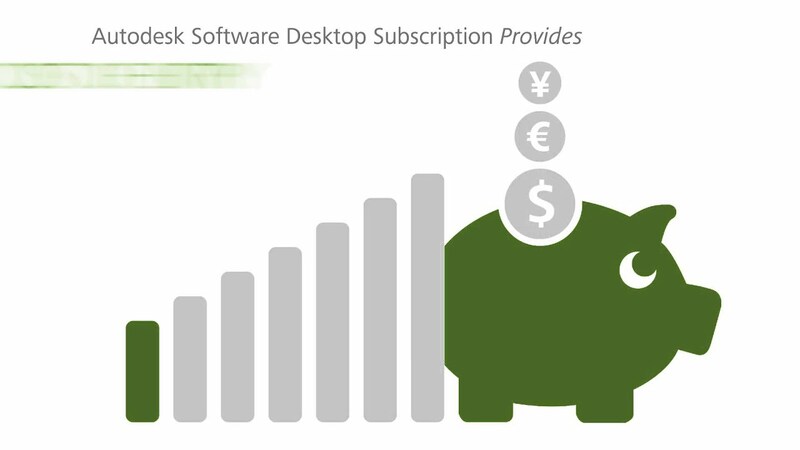 The Autodesk Subscription is the most convenient and economical solution. With an affordable Maintenance Subscription, Autodesk will send you the latest software updates as soon as they are released. This applies to both interim releases and annual releases. The result is an affordable way to update your tools. Whether you're in the office, at home, or on the go. Thanks to flexible licensing rights, you can now work easily from anywhere using the latest versions or older versions. This prevents compatibility problems and increases collaboration during your projects. Get the same advantages of permanent licensing and the Maintenance Subscription without the major investment. You can rent Autodesk software on a monthly, quarterly, or annual basis depending on your needs. Whether you need software for a specific project, are looking to cover a temporary workload peak, or lack the necessary capital for a permanent licence as a freelancer or start-up company, the flexible and scalable Desktop Subscription is the perfect solution for your specific needs and budget. Focus on your design by sending computer-intensive tasks such as analyses, complex calculations, and time-consuming rendering tasks to the cloud. This will help you work more efficiently, whenever and wherever you like. Unlike your desktop computer, the cloud offers virtually unlimited computing power. The Cloud Service subscription from Autodesk gives you access to several powerful calculation tools that can easily take over any time-consuming task. The collaborative tools will improve your team's communication and give you instant access to your files at home, in the office, or on the go. You only pay for the cloud services you actually use, whenever you need them. If you are looking for a temporary licence, opt for a Desktop Subscription. If you need something more long-term, we recommend obtaining a permanent licence through our Maintenance Subscription. Would you like to receive personal advice or apply for an Autodesk Subscription?